Even the patent lawyers loved it! 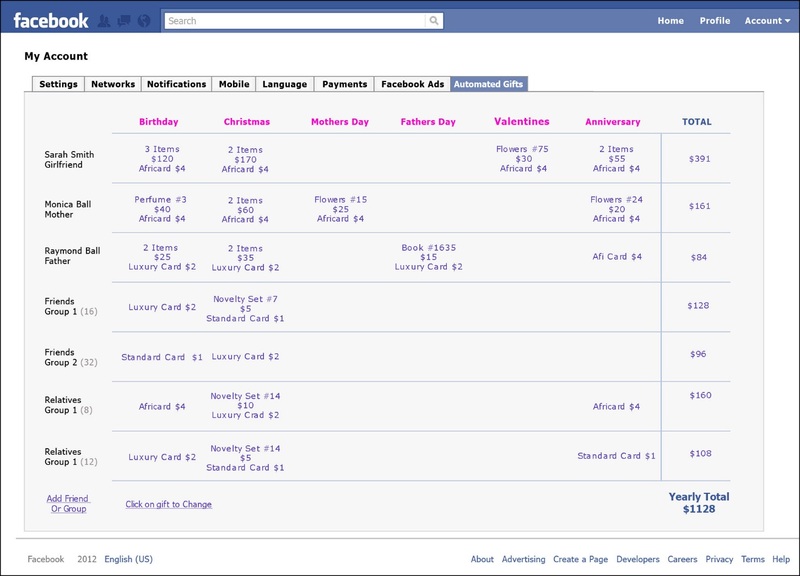 Facebook Gifts is simple, clean and unobtrusive (it’s just one word added to the birthday bar) and due to the network and the “per human results search engine” it’s a significant improvement over all competitors. The pop-up box appears when you click the button that says gifts later, some other functions will be available, for choosing the type of gifts displayed such as: For Him, For Her, Mums, Dads, Novelty, Clearance, $5, $10….. The “gift picker, pop up” shows only the most popular items. There will not be endless options but rather a concise selection, which due to collective ordering greatly reduces the price, not only will one receive the highest ranked presents, one receives the highest ranked presents at wholesale prices. A more varied selection of gifts will be available in a separate window. The “local” button sets the gift picker to display only gifts in stock at the nearest resort network, thereby making orders placed before 10.30 am deliverable on the same day for a reasonable fee or available the next day for free. The simplest part of all is the mathematics, if each of Facebook’s 900 Million members, ordered one present as illustrated annual revenue would be $108 Billion. The Africard logistics are simple. The card will be written along with a short note by a child such as Noboe for which he receives $2. Having lived in Africa for 11 years and eventually realizing I was spiritually more akin to the Mandela Park Township Folk than to any other group organization, I can confidently assure you that in Southern Africa $2 for an hours work is a considerable amount of money. Go deeper into Africa and it’s a fortune. The Africard principle is in many ways sponsorship of an African Child and their family. This concept provides much needed money and promotes literacy and the learning of languages. If everyone on Facebook sent one Africard a year, 750,000 African children and their families would enjoy a sustainable future, if everyone sent 10 cards, well…. The math is simple. All cards sent will be made from 100% recycled paper. 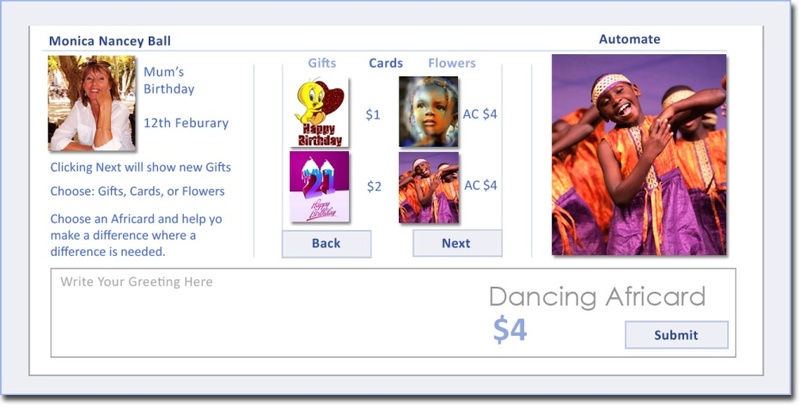 Full credit for this addition to Facebook Gifts goes to Mike Enslin, S-World No2: his concept turns a profitable initiative into a money-making machine. It also solves a number of start up logistics problems, as it will be some time before the parent resorts are set up to handle packaging and delivery. Automation also assists “occasional” Facebook users. To use, one simply goes to the automation page and picks gifts and card choices for the year ahead. One has the choice for gifts to be delivered directly to the recipient or to receive them personally, so one can give them personally. Besides the wholesale rates and convenience, this eliminates one having to wrap the gifts, as gifts arrived pre wrapped, and if one desires, extravagantly pre wrapped. 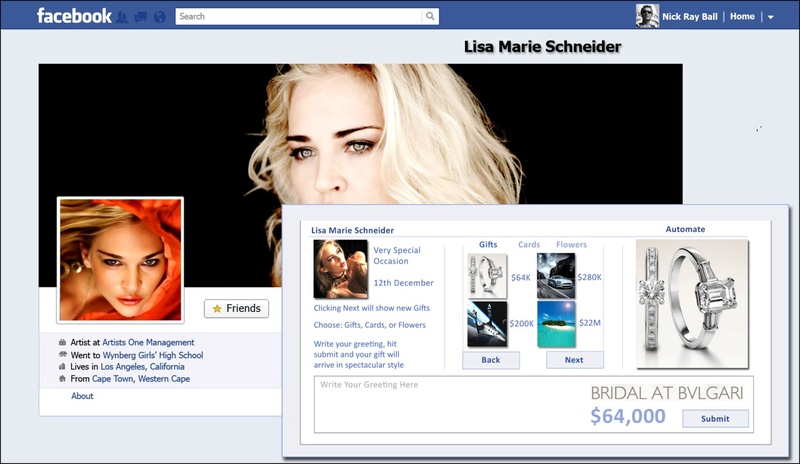 The convenience of Facebook gifts is further highlighted in the relatives and friends groups, gifts and cards that most would not often send due to the time and effort involved and in general not having access to the addresses. However, from a personal perspective if I had forty or so birthday cards and a dozen or so novelty presents on my birthday, I would be delighted. This action, particularly with relatives, has significant Facebook membership implications. I have about 20 relatives I’d like to send cards and small gifts to, but less than half are on Facebook, particularly the older generation. Whether one actually wants to have Grandma seeing ones daily posts is a personal decision, so some privacy settings will need to be enabled. This said I’d certainly want all my relatives on Facebook Gifts so I could send them presents, and knowing Grandma and Pops’ they would love nothing more than receiving them, so Facebook manages to attract many new members, and as they will know, the baby boomer generation spends a lot more money than siblings generations. Once more this exercise is circular, if ones grandchild asked grandma to sign up so she can send grandma gifts, it would make sense to Grandma that her granddaughter would like to receive gifts in the same fashion. 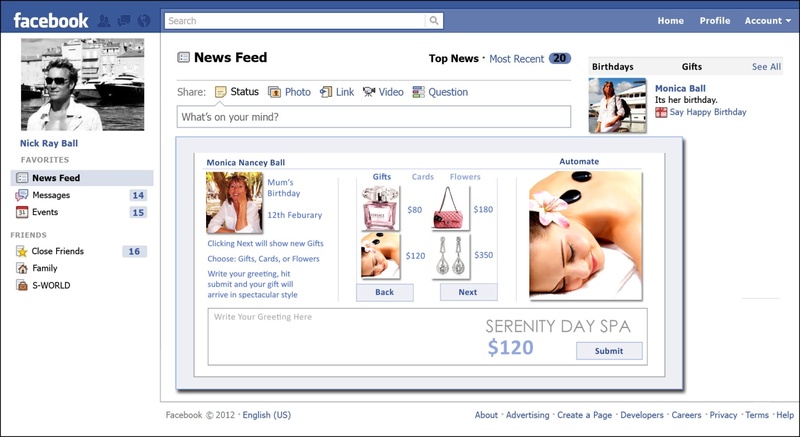 Indeed this phenomenon could see more money being spent on Facebook gifts by new members than current. With over 40% of the worlds wealth held by the top 1% of people “Lx.” caters to that market. Value, service, experience & exclusivity, must of course apply. Value comes in two forms. Firstly the collective ordering process dictating wholesale prices on items from Bulgari wedding rings to Aston Martins. Secondly the “GDP Buster” hi spends mark up initiative, which sees “Lx.” concierge applying a dedicated service representative organizing an individual or families purchasing needs, hi spenders in this category see “Lx.” Lowering their mark up to 2.5% where as the industry standard is 100%. Experience comes from the many S-World contingents and “Lx.” Lounge bar’s found within the resort networks. Plus of course Facebook is an experience in itself. Exclusivity comes from membership, one would need to have a financial advisor or bank manager declare that the member is either in the top 1% or earners, or is in the top 1% of net worth individuals. Exclusive shopping arrives in the form of the “if-you-have-to-ask-you-can’t- afford-it-range” selling items from Private Islands to Picasso Paintings. The trick of course is to make the receiving of a “Lx.” gift a similar experience to opening a bottle of Dom Perignon Rose 1959 on a slick Super Yacht in St Tropez…. One can tell when the “Lx.” representative gets out of an Aston Martin, that it going to be special, you can tell from the look of the concierge representative it’s going to be stylish; the gift passes hands to excited eyes, and as the bows and ribbons are removed one see’s those magic two letters and the full stop “Lx.” And one knows whatever is inside will be special and the sender has style. Reinventing Steve Jobs’ end-to-end customer experience, from the icon on the website, to the films of the products, to the choice of gift, to the delivery method, to the delivery vehicle, to the delivery person, to the bows and ribbons, to the packing beneath, to the smile on the recipients face, the user experience never leaves “Lx”. It’s a step up from Neiman’s and Saks Fifth Avenue and Gump’s. Of course “Lx.” itself becomes a status symbol, as anyone who receives such a gift will know it is from the top one percentile of global earners or net worth holders, or at least as close as it can actually go beyond the reference of a financial advisors declaration so it would not be hard for the 2nd percentile to gain membership, alongside this would be siblings and parents. Considering only 30% of the population use the internet, of which 45% are facebook members in the region of 5% of facebook users would fulfill the “Lx.” membership requirements, this equates to 54 Million members. If one in ten were to use “Lx.” to make a purchase as highlighted Facebook would generate just under $350 Billion in revenue. Lastly on “Lx.”: One will note the branding does not include the name “Facebook”, despite the financial advantages, which in tern lead to great profit which equals great good. It is possible that Mark Zuckerberg and Facebook do not like the concept as it does not cater for all. Should this be the case a swap will be made with S-World for the business gift application as described in the forthcoming S-World financial section. Due to the popularity of Facebook gifts with test subjects, it implementation opens the door for a full e-commerce service, selling top ranked items produced via the entire network, including big brand investors items. 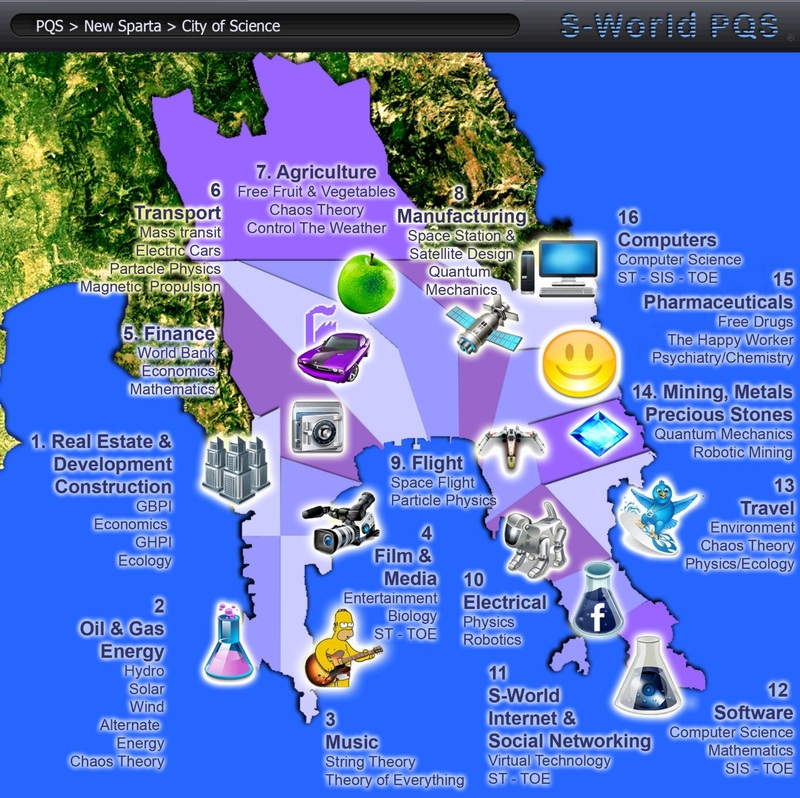 It will not be an all encompassing service, whist all goods from Mountain Bikes to Airplanes are available only the top 10% of the “per human results search engine” rated goods and services will be available. This serves two purposes. Firstly it follows Steve Jobs business philosophy, “Deciding what not to include is as important as deciding what to do”. On Steve’s return to Apple in 1997 a review of all the Mac computers was initiated, there were a dozen Macintoshes ranging from the 1400 to the 9600. When he asked the team the simple question “which one should I tell me friends to buy” no one could give a strait answer so he scraped 70% of the range. This process lead to Apple consolidating to just 4 machines: The Power Mac G3, The Power Book G3, the “iMac” and “The iBook”. This action began the transition of a company on its knees on its journey to become the biggest company in the world. Secondly limiting facebook to the top 10% of products allows room for the S-World Business network and other retail stores to compete without competing, as the balance of 90% of goods will be sold via those mediums. For example consider TV Sets, Facebook Gifts and stores would only sell the top 4 ranges, maybe two brand names and two new brands, personal brand love varies from person to person, and just because a TV Manufacturer only received an 88% rating does not mean it’s not an excellent buy. In the same manner as Facebook Gifts plus, “Lx.” concierge will offer an all encompassing service to members in a similar way to Amex Centurion, albeit additionally concentrating on retail, auctions, real estate, personal shopping and services alongside travel and general arrangements. Considering Facebook shareholders, management and employees desire facebook to become the most successful company on the planet in all areas. Alongside Criss Cox’s wish to connect facebook to everything you use is not an imaginary evolvement. 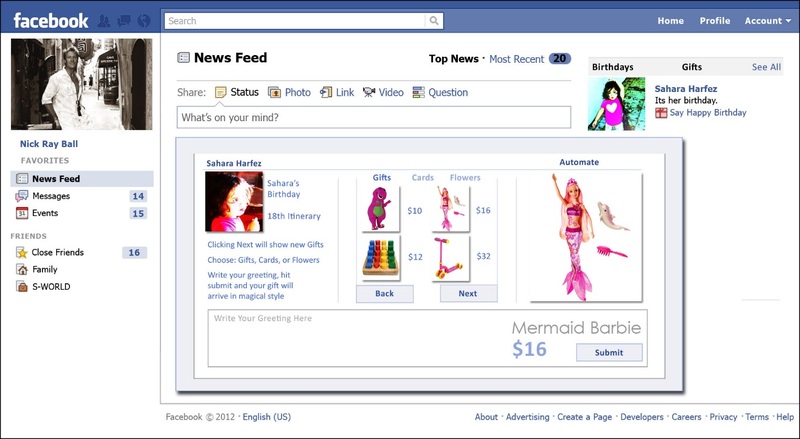 Given the framework to excel the idea of Facebook Stores is an obvious extension to Facebook Gifts and “Lx”. How will Facebook Stores excel? The top 10 percentile of good, products, real estate and services initiative is on its own enough to warrant the term “a significant improvement over most or all competitors”. Within Mall based retail, the physical stores themselves, the quality of service and the enthusiasm offered by staff are also pivotal to achieving greatness. We have already discussed the substantial location enhancing initiatives; however said location enhancements were specific to the resort as a single unit. 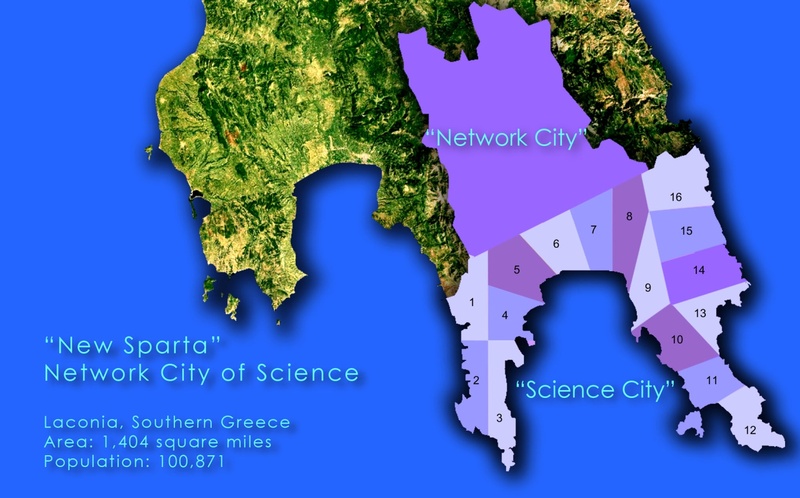 Within the resort itself their will be a variance in the “Location, Location, Location” principal, and example in real estate would be a property that garden opens out only a lake, or built on a mountain. In retail within a Mall or a Mall within a Marina, there are of course higher and lower traffic areas. As Facebook Stores themselves will become location-improvement event they shall receive the fist pick of location within the Malls, a significant advantage and an immediate boost to their capital asset, as a prime high traffic location within a Mall could see two maybe three times the sales of its low traffic counterpart. The cost of building a Mall is in the region of $400 per square ft, add the infrastructure and land and a figure of $532 per square ft is arrived at. For Facebook Stores we are considering 25,000 sq ft per store, a size equal to Bloomingdales outlet stores and slightly bigger than Apple’s largest store. The cost per store equals $13,300,000 add $2,325,000 for shop fitting and miscellaneous expenses and we come to $15,625,000 per resort, which when multiplied by the 256 resorts gives an even $4Billion initial investment. The average staff levels within a Mall retail store are one per 1,000 square feet, in the financials one per 800 sq feet is presented. The average Apple floor staff wage is between $9 and $15 per hour, for Facebook Stores entry level staff a basic of $15 per hour plus profit share and commissions is offered, which if distributed evenly would double their salaries to a figure in excess of $60,000 a year. However profit share and commissions are awarded on a performance and customer rating statistics, alongside QE & EEE points (to be clarified later). This will have the effect of seeing exceptional performance being rewarded with plus $100,000 salaries often for US citizens without 16 plus education. This exercise along with the desired glamour’s stature of being a Facebook Store delegate is designed to create the enthusiasm akin to that of flight attendant in the 60’s and 70’s, as highlighted in Leonardo DiCaprios film “Catch me if you can” At the end of the day, these staff initiatives boil down to one objective, to motivate to generate as much revenue as possible whilst increasing facebook’s brand image on a daily basis. Before we look at the figures, let’s examine the see the original opening paragraph to the Facebook section. 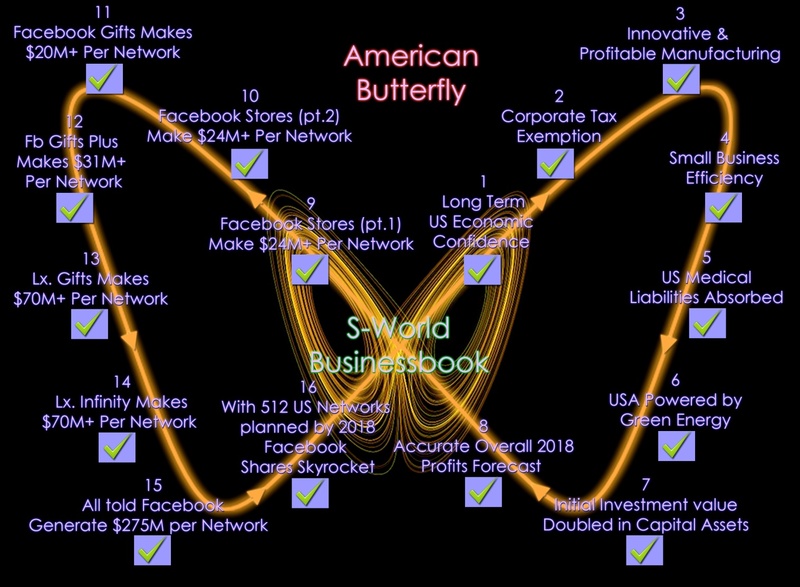 “On the subject of making profit when I worked out the “American Butterfly” enabled Facebook 22 year profit forecast, I felt like the Italian Scientists at Cern when after they broke the speed of light, there simply had to be a mistake. From the parent resorts alone, from a $4 Billion investment, without a single customer moving a mouse or paying a cent in cash we were just under $1.5 Trillion, what on earth was the figure going to be when we added paying customers, e-commerce and revenue from the sibling resorts? I checked and rechecked, but I could find no errors. This becomes possible due to the $425 Million resort network economic stimulus initiative. Seeing as Facebook Stores sell will just about everything including holidays, Concept cars, Real Estate, Solar Arrays and Financial Services alongside standard retail and apparel, it’s fair to direct $100 Million of the economic stimulus their way. The following spreadsheets are available at www.s-world.biz/downloads, the one presented is a condensed version, first we look at the amount of staff and their basic salaries. Facebook Stores: Profit, Dividends & Capital Assets. Above we see the $100 Million economic stimulus return $24,369,441 after a 50% mark up on costs of goods, including staff operations and sales tax. American Butterfly Question – AB9: Is this figure a reasonable assessment? The “Half Dividends Reinvented” column see’s the choice of any company re-investing their dividends into the next resort network; if this is enacted POP 1 profits are redirected to balance the books. The POP 2 Column represents the 52.5% “POP Cash Injection” into sibling resorts, which pays for their next store within the next report. This analysis accounts for three location improving factors, before addressing the long term desire for properties to become more affordable. Locations Butterfly: The previously highlighted premise that due to the 16 location enhancing exercises, properties within resorts will be worth double their infrastructure, land and building costs. Prime Position: Introducing the unique once off factor “first choice of location within the mall” and whilst it has been mentioned, that foot traffic could double or triple in a prime positioned store for safety a 50% improvement in foot traffic is presented. Economic Recovery: The general principal that once growth returns all properties will rise by 70% to their 2006 value. Affordability: The “American Butterfly” desire to increase living standards for all as illustrated earlier on sees a 50% reduction in property. Once the dividend yields, general profits and the second phase of resorts are accounted for, all in, by 2038 the economics stimulus is generates facebook $1.5 Trillion. Adding up all components facebook e-commerce, stores and concierge services are forecast to generate just under $275 Million. America Butterfly Question, AB15: Is this figure a reasonable assessment? On the 18th May Facebook launched its IPO (Initial Public Offering / Stock market Floatation), shares were sold at a record setting value of $38 each, at the end of the day valuing Facebook at $104 Billion. However as soon at the IPO had launched certain narrow minded vultures within the financial sectors started to look at what Facebook makes now, rather than what it could make in the future. As such shortly after facebook stock lost about 20% of its value. By the end of August Facebook shares had lowered to 50% of their initial value. Currently Facebook make around $1Billion a year in profit, which compared to other companies at a similar share value is low, as such dividend yield will be comparatively lower. To make matters worse the swing of facebook users from desktop to Cellular phones impacts revenue as currently Facebook to not have an advertising strategy for this medium. All told if we take into account the “Lx.” forecasts are split between 768 resort networks “American Butterfly” enabled Facebook profits total just over $180 Billion. On top of that is the $1.5 Trillion 2036 Real Estate assets. America Butterfly Bonus Question, AB16: On validation from budgetary and financial analysts alongside the bipartisan cooperation from US governments, is it fair to say Facebook shares are due to sky rocket?